A few months ago, I came very close to signing up for a monthly subscription to receive one outfit a month of fashionable workout clothing from a line called Ellie. The whole reason was a shirt I fell in love with. I ended up not signing up that night and honestly forgot about it. Then I was asked to work with Target for their C9 by Champion® line at Target. I was familiar with their line and budget friendly prices but had yet to try it out for myself. I was presented with a gift card to purchase and review items from the C9 line. My best friend Keri was in town this weekend so we happily stopped at our Target store to do some fitness gear shopping. That's when I saw it - a nearly identical shirt to the one I almost agreed to sign up for a monthly membership which was more than I spend for my Disney Premium Pass. I was so excited to see this C9 by Champion® Women's Layered Tank with Bra ($22.99) that I instantly tried it on, loved it and made it mine. It's adorable and very comfortable. The nearly identical shirt I wanted from Ellie was $34.99 + shipping. 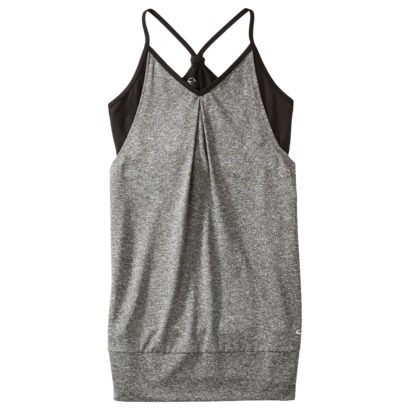 The C9 by Champion® Women's Layered Tank with Bra is fashion forward, flirty and a lot of fun. It's a perfect Yoga shirt or other non-impact sports shirt and I love that it has a built in sports bra. It's also great for lounging around the house - way cuter than a t-shirt. Keri and I found a ton of C9 by Champion® outfits we loved while at Target on this trip. Unlike my option above, the colors offered are bright and coordinate with multiple pieces. I tend to go for dark and dreary with a splash of pink, unless I am at a race. From running skirts, heat gear and compression sports bra's, C9 by Champion® has something for every athlete. I was beyond impressed and will be purchasing more items online (my particular Target store was a bit picked over in my size - this line must be doing very well in Tampa). Check out the goodies Keri and I found below! So - I said a giveaway! Target wants you to have the chance to try out their C9 by Champion® line. They are giving a $25 gift card to one of my lucky readers. They want to know what your favorite C9 gear is or which item is on your wishlist. You can check out the entire line out here. Also, be sure to check out some awesome C9 at Target gear, showcased by the Hungry Runner! Please enter through the rafflecopter widget below and leave a comment in the comment section to be entered into the contest. If you are unsure how to use Rafflecopter, click here for a short video tutorial. I loved that running skirt too! It would be perfect for fall time in FL. I was very tempted to get it but wouldn't get much use out of it. They had one running skirt that looked so much like lululemon but I didn't get it. I don't train in skirts and I have so many already. 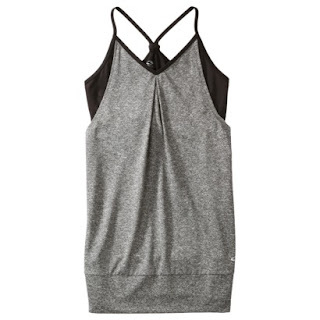 I LOVE the C9 by Champion® Women's Layered Tank with Bra! I checked it out before and thought it was fabulous. I tried those on while there! Very comfortable. That is the type of short I generally run in. Ok I have to admit this: when shirts go on sale or deeply discounted I buy numerous ones and hoard them in my closet. Yes I said it! I have even been known to buy them for people because of the great price and colors- especially if I know me and my running partner are going to do a team race. The C9 line is so affordable & comfortable. I just went to Target a few nights ago unexpected and saw all of the new summer colors & styles and love them! Jen, I am the same way - even in daily clothes. I tend to buy the same shirt in multiple colors too!! I just did my spring/summer closet purge and was shocked at how many duplicates I owned due to hoarding during sales. I have bought a few pieces of the C9 line and I love them but I don't have that super cute and sporty tank with built in bra yet! You will love that top Kim!! I love the C9 by Champion® Women's Run Short with Compression. I really like the fact that they have the compression shorts underneath but the mesh shorts on top! What a brilliant idea for women with an "athletic build" like me! :) P.S. I also LOVE the top that Keri and Megan found! Super cute! Beth, thats the type of shorts I have ran in for the past 2 years. I love them and was super excited to find them at Target (vs. the $50+ I spend on Nike). Definitely the women's mesh shorts for me as it's so hot and humid in Florida! :) Thanks so much! That it sure is!!! 95% humidity when we ran yesterday...sigh! I love the Double Strap Cami and Layered Tank with Bra!! I've been eyeing them in my local Target! So cute right!! I really do want one in every color! I love the C9 stuff. I've only got a few pieces, but I love hearing about the stuff other people love! Awesome! I love hearing how so many people are currently enjoying this line. Men's running shorts would be great for those hot summer days of running! Thanks! I hear ya on those hot summer days Ray! Good luck on the contest! I would either get the Mesh Running Skort (So cute! )or the Fitted Knee Pants. Ohh! I tried on the mesh running skort. It is adorable on!! I saw that tank yesterday and almost tried it on! Pretty sure I'd have to buy it too if I won! i'd want to try out the knee pants! Hi Megan :) We tried on the knee length pants, they are very cute on!! Good luck! I would get the running shorts! I'd get the top you have on. I want that top in every color! I would choose the Women's Tank with the built-in bra for support to use for working out at the gym! The pink Layered Tank with Bra has my name written all over it! Right! That is the one I am going to order online! 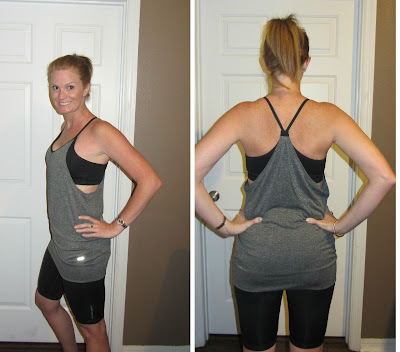 I love the layered tank with the built-in sports bra! Considering I live in gym clothes when I'm not working, it would be nice to make myself look cute and semi-presentable while out and about! You sound exactly like me. My UPS man will be impressed when I stop answering the door in t-shirts! If I win, I will get some bright colored shorts. I've realized I own a dozen black capris but no cute shorts! I am the same way!! I recently started branching out w/ brighter colors but I never wear them! Ohhh I saw that one there! I didn't try it on though. I may have to check it out. It's adorable. I so want the pink one!!! They didn't have it in my size. I am going to check the Brandon or Gandy store! I need to try that top - it is so cute! Target, here I come. I love the Target C9 compression capris. Love shopping at Target for workout gear!!!! This was my first go around w/ Target workout clothing and I am beyond impressed! I'd like the Double Strap Cami. Thanks for entering! Good luck, I am drawing the winner tonight! You will love that shirt Ellen! I tried those on while there. They are very comfy! I loved that those are reversible! I would get the layered tank with bra. Perfect for working out! AND it is cute and comfortable! Athletic wear encompasses clothing worn to work out in gyms, to participate in sports or sports training, to yoga and pilates clothing styles, to the traditional sweatsuit and champion is really an excellent brand in the athletic wears.